This unique 18k yellow gold woman's diamond engagement ring has 24 round channel set diamond side stones. 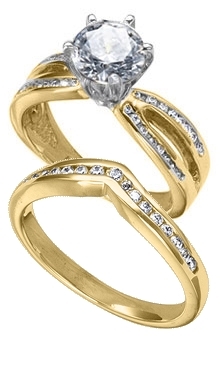 The matching band is a v-shaped, contoured 18k yellow gold band with 17 channel set .01-.015 carat diamonds. All diamonds in the matched set have a color of G-H and a clarity of VS. The total carat weight of this set is .42 carat.